WordPress comes packaged with one very useful default theme called Twenty Fourteen. Most bloggers who use WordPress usually don’t waste any time at all in finding a theme that they like better than the default theme. The Twenty Fourteen theme is meant to get you started. Although you’re not limited to the default theme, it’s a very functional theme for a basic blog. Free WordPress themes are popular because of their appealing designs and their ease of installation and use. They’re great tools to use when you launch your new blog, and if you dabble a bit in graphic design and CSS (Cascading Style Sheets), you can customize one of the free WordPress themes to fit your own needs. By using free themes, you can have your blog up and running with a new design — without the help of a professional — pretty fast. And with thousands of themes available, you can change your theme as often as you want. Finding the theme that fits you best may take some time, but with thousands available, you’ll eventually find one that suits you. Trying out several free themes is like trying on different “outfits” for your blog. You can change outfits as needed until you find just the right theme. 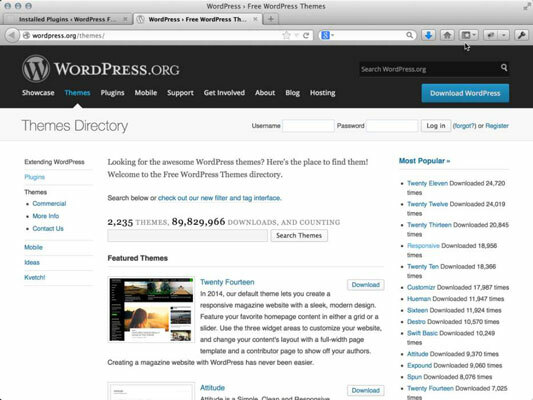 In July 2008, WordPress launched the official WordPress Themes Directory. The WordPress.org website lists the basic requirements that theme designers have to meet before their theme is accepted into the themes directory.